Looking at winning countries over the last two decades, there has been a marked move eastwards, as more countries from the former Communist block have joined the contest and award points to each other. The causes of bloc voting are debatable; some say it’s political, others argue that it is cultural. And the voting system is not the only thing controversial about Europe’s largest television production and biggest non-sport event. In 2009, when the Eurovision was held in Russia, Georgia originally announced to withdraw from the contest in protest of the 2008 South Ossetia war. It then decided that it would be more fun to embarrass the host country and chose a song titled ‘We Don’t Wanna Put In’ – an obvious mockery of Russia’s Prime Minister. The European Broadcasting Union ruled that the lyrics should be altered, and Georgia pulled out of the contest. Musical power games are also frequently played in the Balkans. In 2005, members of the band that represented Serbia and Montenegro draped themselves in the flag of Montenegro and not of the joint state, which angered many Serbs. 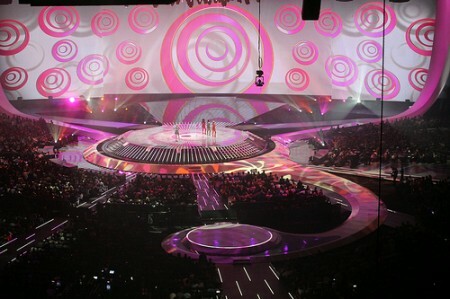 The same band was renominated in 2006, but this time Serbia and Montenegro withdrew following the row over the internal selection. The timing of the final was particularly sensitive, as it was only hours before Montenegrins voted on their independence from Serbia. A year later, Serbia debuted as Republic of Serbia – and won! Another year later, it hosted the contest with a tune hailed as gesture of nationalist defiance over the secession of Kosovo. For some countries, it seems, the Eurovision Song Contest is no place for frivolity. However… watching the Russian version of the backstreet boys and Serbia’s answer to retro-Barbie contesting this Saturday, one might find this hard to believe. Eurovision might not be registering the most accurate pulse of our times…and it’s not even a platform for making singers and songwriters sustainably famous. There are some highlights though in Eurovision’s history: Abba became famous after winning in 1974….for example,…and this year Azerbaijan receives a special and well-deserved promotion campaign: http://eurovisionaz.com/azerbaijan.